After applying through Clearing, Chris Underdown enrolled on a BA (Hons) Music and Sonic Media (now Sound Design) degree at LSBU, where he was inspired to start his own music recommendation app business. Chris was working on fine art sound and music installations when he realised that his real interests lay in sound production. "I wanted to specialise in sound. LSBU's course description was more geared towards sound design and experimental sound, and I felt that it prepared you more for production in the industry," he explains. 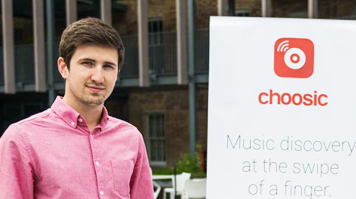 While in his second year at LSBU, Chris started developing his music discovery app, Choosic. 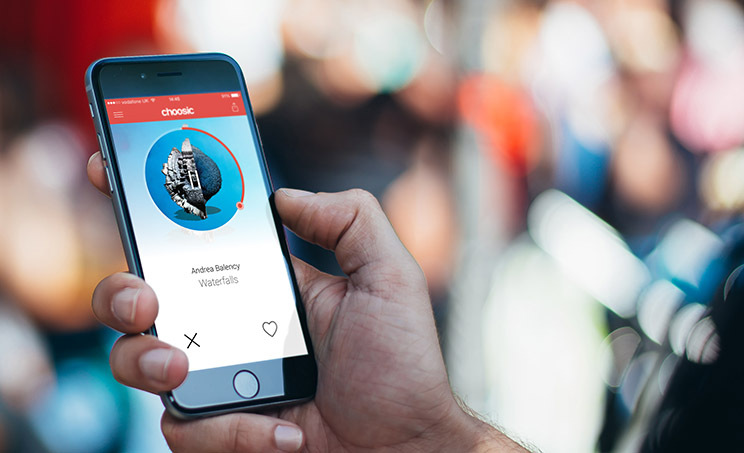 The app provides users with personalised music recommendations and intuitively builds individualised playlists. "The idea for Choosic started after I did a research project on digital music distribution at LSBU. There are plenty of places to listen to music and stream music from, but now we have a problem discovering new music. We need something to refine and filter music choices," explains Chris. "I did market research and the idea came from the question, 'how can I solve this problem?' We surveyed nearly 350 students and found that 80% said they wished there was a better way to discover music, so we saw an opportunity." "I didn't know about the Student Enterprise team at LSBU, but if I'd known it would've inspired me even more to choose LSBU. I think that the Clarence Centre for Enterprise and Innovation is the best thing about the University," Chris comments. Chris developed his business on Student Enterprise's Entrepreneurship in Action scheme (now called Spark), which provides funding, office space and advice to student entrepreneurs while they study. He also competed in the LSBU business plan competition and came runner up. "I got a lot of support on the business side of things. I come from a creative and ideas background, so my business expertise was vague," he says. My business knowledge has been propelled so far from all the advice I've gotten from LSBU. Chris is currently taking his business to the next level on a six month LSBU entrepreneurial programme, where students and graduates receive intensive support through mentoring and workshops delivered by investors, business experts and successful entrepreneurs. The Choosic team is currently gathering more data on music trends and learning to better understand their users, which are currently tallied at approximately 26,000. "We want to build a large user base and further develop our product. We aim to be a top discovery tool for the end user and an A&R tool for the music industry," Chris says.